Melissa Clark’s morel piece ($) last month got me all hot to buy some fresh morels, but at the usual New York price of $60 a pound, it wasn’t happening. Then one day I heard some French chefs talking about how cheap the morels were at the Manhattan Fruit Exchange in the Chelsea Market, so I made a trip. And there they were for $19.50 per pound. Still, though, I was dainty, and bought just enough to make about a quarter of Clark’s recipe, just as an appetizer. I heard one of the chefs say, “l’échalote et la sauge avec les morilles…c’est un bon mariage.” With that in mind, I swapped her chives for sage. I won’t reprint the recipe, because you don’t need exact amounts or instructions. You sauté some chopped shallots in butter for a few minutes. 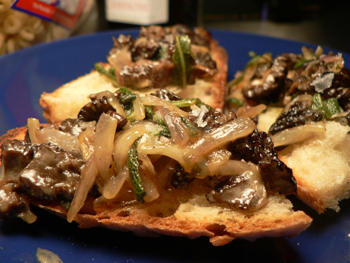 Add as many morels as you have, sliced in half, and cook for another five minutes. Add a couple tablespoons of wine, cover, and cook another five minutes to soften the mushrooms. Uncover and let the liquid evaporate, stir in a bit of heavy cream, season, and let thicken for two minutes. Serve on buttered toast, sprinkled with chopped chives (or sage) and flaky salt. I went back to the Fruit Exchange the following weekend and bought about a big bag of morels, and I fulfilled my fantasy of making a morel tart! What could be more decadent? I flavored it with shallots and sage again, but otherwise used a basic custard (one egg plus equal parts milk and cream). I also added a few tablespoons of fromage blanc, but I wouldn’t do that again. I hadn’t cooked with fromage blanc before, and it really makes things quite thick. I wanted to taste morels suspended in a light custard, not a cheesy pie. For this tart and every other tart I’ve made in the last month, I’ve used the same crust. I think I’ve finally found my foolproof formula for pâte brisée: 1.5 cups flour, 1 teaspoon salt, 7 tablespoons butter, and 4 tablespoons water. It comes together easily every time (even by hand), and it cooks up tender and flaky. I’ll try it out on Mom when she comes to visit (for a week!) in August. 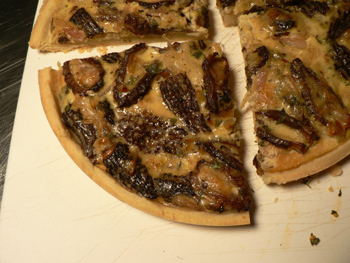 Oh, I love morels and I adore tarts of any kind. Unfortunately, I never get enough of either of them. Tarts because they go straight to my behind and morels of the price. My brother has a secret place for picking them, and of course he brings them to me when he does, but it’s not often enough. I’ve used the dried morels for many recipes with good success, they’re usually not so expensive. I think shallot and sage is a good combination, but I think your shallot and chive is probably better. I also like shallot and thyme. Ah, les morilles… I don’t get to eat those very often either. I live 50 miles north of NYC, and it might as well be the moon as far as getting some fancier foods goes. When I was a child, we used to go mushroom picking very often with my parents in the forêt d’Orléans, and my mother would sauté them in a standard concoction of butter, parsley and garlic. Sooo yummy. Shallots and sage sounds great too. I have not tried morels but do make wonderful mushroom concoctions with hen of the woods – you can get them at Union Square though I am not sure if the vendor is there now or they are a Fall thing. In fact those mushroom were part of the inspiration for my blog. I love the stories of these people and their secret morel locations, Mary. I hear they do that in France, too. I have dried morels, but I never really use them. Christine: you’re killing us with your story of the Orléans forest. Can we please be there now? Did you grow up in Orléans? Ooh, izzy’s mama, I’ve never tried hen of the woods, although they definitely have the best name of any produce! Leland: I grew up just a few miles south of Paris, but my parents had a house in Sologne (game and mushroom country par excellence) where we spent most of our weekends, hence the frequent outings in forêt d’Orléans. My family is originally from Poitou-Charentes, and mushroom picking was also something we did with my grandfather (there we mostly found pieds de mouton—sheep’s feet, I have no idea what they might be called here) typically around the same time of year that we would harvest the grapes in his vineyard and make wine (yes, my cousins and I would be the kids wearing rubber boots squishing the grapes in the big barrels on top of the horse-drawn flatbed carriage). I know it probably sounds like paradise to you, but you should know this: the wine my grandfather made was really pretty awful… The meals my grandmother made for the harvesting crew, however, were truly memorable. I LOVE morels, but have a warning… Two springs ago I too was bit by the morel bug so I went to a fancypants place in the East Village known for it mushrooms (I shant name names) and asked to buy morels. Alas, they were out of them, but the proprietor told me he had, in stock, some mushrooms called Gyromitra (aka false morels) that would scratch my itch. They were about a quarter of the price so I greedily bought them. Lucky for me I just happened to be reading a book that night on strange ingredients that warned against Gyromitra with a huge, boldfaced warning that, if they are not prepared properly they are deadly. And not just the mushrooms are toxic, but also the steam that comes off them can cause you to go to the ER. Apparently some people can cook them without harm, but you really have to know what you are doing. I was shocked and a bit peeved that the man that sold them to me had not warned me at all, that he had basically sold me a bag of Russian roulette. I just wanted to warn people that these fungi are out there and that they’re dangerous and that when a morel craving strikes to think twice about settling for second best.